There's no other way to say it: Francesca is a hot name. Maybe it's the Italianate origin, or the three flowing syllables, but something about the name Francesca makes me think of the new girl who shows up in class and immediately has everybody transfixed with envy, love, and lust. She's not conventionally popular, because she just transferred from a different school — possibly abroad — and she doesn't have a clique. She's nice to everyone, boys and girls alike, but there's something mysterious about her, maybe a little unknowable. She has friends in different countries, makes her own clothes, and listens to cool music you never heard before, but she isn't at all snobby about any of this stuff. Even though she's sweet, boys are a little afraid to ask her out. In high school and even beyond, she was the kind of girl I wanted to be, but never could — because Francescas are born, not made. The name has a number of variants, all of them less hot. Frances, despite Frances Bean, always makes me think of a bureaucrat handing me forms to fill out. Fran's nasal sound is only intensified by the, um, nasal sound of Fran Drescher. Frankie's kind of cute, and has the added bonus of being the name of the main character in The Member of the Wedding. But if Frankie has bestowed this moniker on herself, it's just one of those annoying boy-girl names. Without a doubt, the name Francesca outshines its relatives the same way Francesca makes all the other girls at school look just a little bit ordinary. Maybe part of Francesca's appeal is its rarity. It enjoyed a big rise from the sixties to the nineties, but it only ever reached as high as #385 in the list of most popular girls' names, and by 2008 it had dropped to #491. If you're a Francesca, it's pretty likely you don't know another one. Not too many celebs have the name either. One of the the biggest names on Wikipedia's list is Francesca Lia Block (that's her under the bed canopy), author of the Weetzie Bat books. 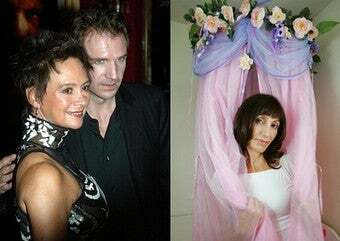 Another is Francesca Annis, Ralph Fiennes ex-partner. They met when she was playing Gertrude to his Hamlet, just the kind of slightly twisted story that gives Francescas their allure. Francesca apparently means "free," which is pretty apt. Francescas are free from the associations that dog more common names. And in my mind, they're also free from the cliques and conventions that made us normal girls at school so, well, normal. If you're a Francesca, well, I'm jealous.